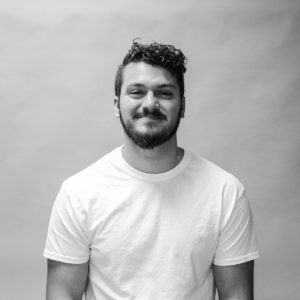 Daniel is a December graduating senior hoping to go into a career aimed at helping others through his passions of design, fashion, and the sustainability. Daniel never imagined that he would be on his way to begin a career in the fashion industry, but he hopes to use his education and future industry experiences better the world around him. Daniel hopes to create practical methods of sustainable garment manufacturing to be used by major companies around the world. His dream is to one day begin a non-profit company aimed at providing work for those in need, as well as implementing sustainable practices and lead as an example for industry. Daniel’s collection, ;Art is Free, is aimed to use ready-to-wear street fashion to send a message promoting suicide and depression awareness. Blended with the style of street art, the collection uses print design to convey a story about the average millennial, their struggle with depression, and hopes to inspire thoughts of a better world after an episode of depression. The semi-colon, which is frequently seen in each design, is the symbol of a movement started by Amy Bleuel, which promotes suicided and depression awareness. The semicolon is used by a writer at the end of a thought, but the writer decides that the sentence has not yet ended. Its symbolism relates to those who have attempted to take their life, but decided against it. Each look hopes to help its audience to understand what the world might look like for someone who is depressed, and help those who experience depression to see the other side of it.